﻿ Chicago Hispanic Newspaper, Lawndale News, Hispanic Bilingual Newspapers, Su Noticiero Bilingue » Chicago Student Heads to Washington D.C.
April 19, 2019 11:30 pm You are here:Home Local News Chicago Student Heads to Washington D.C.
Chicago Student Heads to Washington D.C.
Posted by Editor on July 7, 2016 in Local News | Comments Off on Chicago Student Heads to Washington D.C.
Chicago native Oscar Ramírez received news of a lifetime. 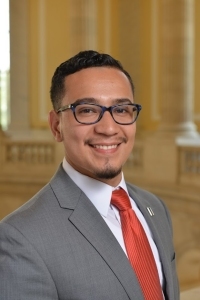 The Congressional Hispanic Caucus Institute (CHCI), the nation’s premier Hispanic youth leadership development and educational organization, selected Ramírez, a student at Northeastern Illinois University, from a sea of applicants to join their Summer Congressional Internship. 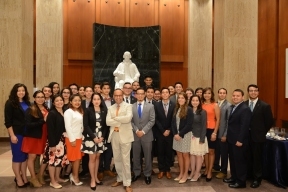 Ramírez was one of 38 interns chosen out of hundreds of applicants across the county to work in the nation’s capital for eight weeks and was placed at the Office of Representative Luis Gutiérrez. “Ever since I can remember, Luis Gutierrez has been a public figure in my life. To tell my family that I regularly see him and have conversations with him is a blessing,” said Ramírez. “I have learned so much in the past couple of weeks than I could ever have reading a book or an article. When I go back, I will take back my stories and knowledge but most importantly I am going to go back and prove to my community that it is possible to come from Albany Park, Chicago and be successful.” The internship is designed to expose young Latinos to the legislative process and strengthening their leadership skills. Ramírez spoke about his goals at CHCI and his vision for the future. Lawndale News: What was your reaction upon hearing the news that you were selected to work alongside the Congressional Hispanic Caucus Institute (CHCI) as part of a prestigious internship? Oscar Ramírez: I remember coming home exhausted from school after a very long day. I saw the unrecognized number and the fact that it was calling from Washington D.C and I already knew it was CHCI. It was honestly the last thing I was expecting you hear that day. The rage of emotions felt that day will be something that will stick with me for the rest of my life. How did you hear about CHCI’s internship? It was actually a close fraternity member of mine that pushed me to do it. I saw the complete transformation the internship had on him and I had a deep admiration for the way he approached things. I wanted to be able to experience what he did and to grow as much as he did. You will be working with Representative Luis Gutiérrez this summer. What do you hope to gain from this experience? I really look forward to building a professional network and gaining knowledge on the legislative process. My goal is to bring comprehensive reform within public education and I want to see how the policy side of things actually work. 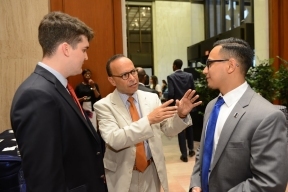 Also Luis Gutiérrez has been a prominent figure in my life and it would be of great honor to work under someone who has for decades been known as one the most vocal and influential Latino leaders in the nation. As a native of Chicago, what experiences mold you to the person you are today? And how will your experiences help serve you as an intern for CHCI? Upon completing CHCI’s summer internship, what goals do you have in sight for yourself and for your community? After the internship I plan to begin applying to graduate school. My goal is to obtain a PhD. in education policy and use my research and practitioner skills to contribute to the building of cultural foundations and political structures that invest and empower diverse communities. Although for me it is important to come back to my community and prove that I am no different than the kids I work with. I don’t want to preach to them but instead show them that it is possible to be educated and successful meanwhile not forgetting where you come from. I realize that I represent something that many of the kids in my community do not have and that is a role model. Make no mistake I will not come back with a “savior” mentality, instead I will make sure to become as accessible and approachable as possible.